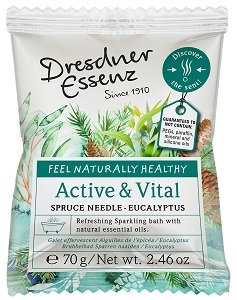 Dresdner Essenz Active & Vital Sparkling Bath Tablet contains natural essential Spruce Needle oil and Eucalyptus oil that helps revitalize your body after athletic or other intense physical activity. Added to warm bath water, it stimulates blood circulation in the skin and helps restore your energy. It also contains nurturing Almond oil that keeps your skin moisturized and prevents it from drying out. This bath contains no PEG emulsifiers, no alkaline soaps, no sodium laureth sulfate, no mineral or silicone oils, no paraffin and no animal-based ingredients or raw materials. Dresdner Essenz - feel naturally healthy!